For the second time in two months, President Donald Trump broke with standard White House practices this week and appeared to offer a glowing preview of positive economic news. Past presidents have generally refrained from mentioning any government economic reports the day before they're publicly released. Among other reasons, the idea is to avoid triggering a hasty or ill-considered response in global financial markets. 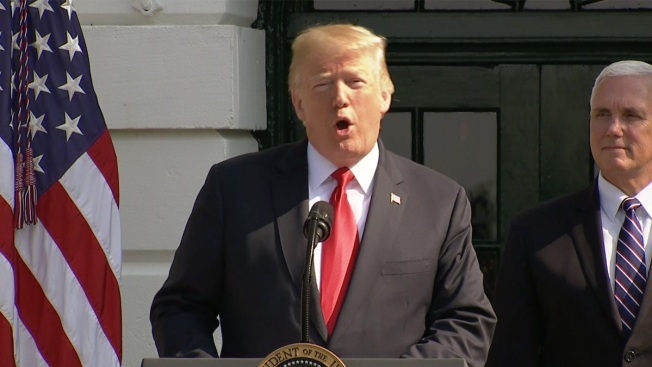 But just as Trump did before the government's May jobs report was released in early June, he chose to brag before Friday morning's release of the government's estimate of how fast the economy grew during the April-June quarter. "Our numbers are fantastic right now," Trump declared Thursday." You're going to see on Friday what happens with GDP." He added, referring to predictions for the annual economic growth rate last quarter, "One of the geniuses on Wall Street said, '5.3.' OK, we'll take anything with a '4' in front. We'll go nice and slowly, right?" Later Thursday, the president made a similar assertion while speaking at a steel plant in Illinois: "If it has a 4 in front of it," he said, "we're happy." On Friday, the government estimated that the economy did in fact expand at a 4.1 percent annual pace in the second quarter, up from a 2.2 percent rate in the first three months of the year. The strong gain, fueled in part by temporary factors that aren't likely to be sustained, was roughly within expectations from economists and investors. Lindsay Walters, a White House spokeswoman, said the president wasn't briefed in advance on Friday's economic report. But Trump had still chosen to boastfully preview economic data ahead of its release, similar to what he did before the May jobs report. Slightly more than an hour before the June 1 release of that report, Trump had tweeted that he was "looking forward to seeing the employment numbers at 8:30 this morning." The value of the dollar immediately rose and Treasury yields jumped in response. At 8:30 a.m. Eastern time that day, the Bureau of Labor Statistics announced that 223,000 jobs had been added in May, surpassing expectations, and that the unemployment rate had fallen to 3.8 percent. Trump had been briefed about the jobs numbers ahead of their public release, said Larry Kudlow, director of the White House National Economic Council. The president's previewing of the jobs report drew criticism as a breach of presidential protocol, though it did not violate any laws. Tony Fratto, a Treasury Department official in George W. Bush's administration, said that Trump's hinting at the strong jobs report was problematic because "you want market participants to get their data from their government in predictable, official ways, not haphazard ones."